The Muñoz 1 globular cluster is seen to the right of the Ursa Minor dwarf galaxy in this image from the Canada-France-Hawaii Telescope MegaCam imager. Astronomers have discovered the faintest star cluster known, a "ridiculously dim" tiny glob of stars on the outskirts of our Milky Way. The globular cluster is so faint, it is pushing the boundaries of how small and dim scientists think such objects can be. "We know of about 150 clusters around the Milky Way," said the new cluster's discoverer, Ricardo Muñoz of the University of Chile. "This is the faintest and most distant one, which means there are probably a lot of them we haven't found. It seems like there cloud be an order of magnitude more clusters than we thought there were." "It's ridiculously dim," Yale astronomer Marla Geha, who collaborated on the project, said in a statement. "There are individual stars that would far outshine this entire globular cluster." 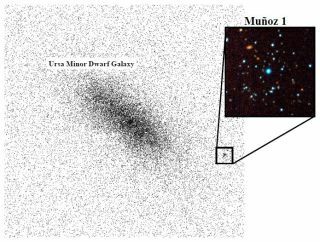 Muñoz spotted the minute object in observations of a mini galaxy orbiting the Milky Way called Ursa Minor. The photos were taken by the Canada-France-Hawaii Telescope on Hawaii's Mauna Kea peak. "I was looking at an old friend so to speak, the Ursa Minor dwarf spheroidal," Muñoz told SPACE.com. "The first paper I wrote was on Ursa Minor so I've always liked that object. Now we have deeper data. While I was playing around with the data, I noticed this tiny little thing sort of southwest of Ursa Minor, but still very close. When I looked in more detail, it looked like a very tiny cluster of stars." Follow-up observations with the huge Keck II telescope, also on Mauna Kea, confirmed the find. Keck spectroscopic measurements, which separate light into its constituent wavelengths and allow astronomers to calculate how fast stars are moving, showed that the globular cluster's stars were moving at different velocities than those in Ursa Minor, suggesting the two entities were separate. And very preliminary measurements of the object's mass indicate that it is likely a globular cluster, rather than the other possibility, an especially small dwarf galaxy, which weighs more than a cluster on average. However, the boundary between these two categories is not well understood, and scientists hope the new discovery could help probe the distinction. "Right now there's no clear difference between star clusters and galaxies at the faint end, and that's something we want to understand," Muñoz said. "Finding this object doesn't solve the problem, it seems to add to it." The main factor that separates dwarf galaxies and globular clusters is their mass, particularly their ration of dark matter, the invisible stuff that seems to make up the majority of matter in the universe. Dwarf galaxies are dominated by dark matter, while globular clusters appear to have basically none. Such a discrepancy suggests different formation methods: Dwarf galaxies are thought to form inside clouds of dark matter, while globular clusters seem to arise from gas and normal matter alone. But with very small galaxies and clusters, the distinction between them can be blurred. The new find is described in a paper to be published in an upcoming issue of the Astrophysical Journal Letters.